The next time you drive past the Martinez Museum, walk through Susana Park, bicycle past Alhambra Pioneer Cemetery, consider whether or not you actually believe the Martini was invented here, step on an Alhambra Avenue sidewalk stamp that says "Smith Street" or express pride in the history of this community, give a thought of thanks to Charlene McRae Perry (1923-2002). Without her quiet but steady focus and her research and writing skills, we would not have preserved so much of the town's history and we would not have the pride and interest in it that is now demonstrated in so many ways. When I arrived here in 1962 to teach at Martinez Junior High School, the two youngest of Charlene's four children were at or near junior high age. She was employed as office secretary at the busy Martinez Camp Fire Building on Estudillo Street, a Horizon club advisor, active PTA member, and busy wife and mother. I got to know her first as a 'mom' attending Back to School Night and Open House and then as support staff to the Martinez Camp Fire Board of Directors which was my first venture into community volunteering. (While on that board I cast a vote that I have regretted ever since but that's another story). 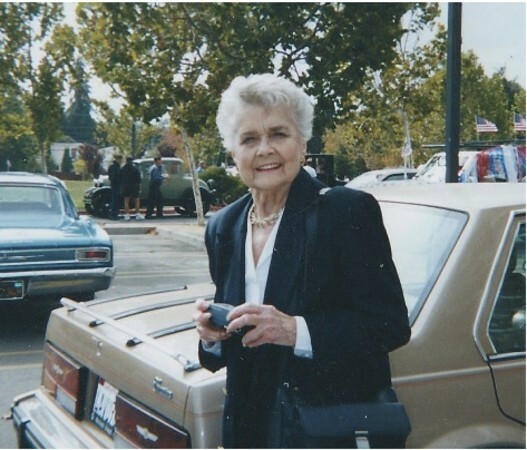 By the end of her life, Charlene had served for two decades as the official City Historian, had with her husband Al saved the Borland home at Court and Escobar Streets from being knocked down for a parking lot and helped found the Martinez Historical Society and Museum. She also had written two books and countless articles on a variety of local history events, topics and people and was working on a third book. She had been honored with the City's Woman of the Year (1975) and Lifetime Achievement (1998) awards, the JC Penney Golden Rule Award for giving back to the community and the Conference of California Historical Society's highest individual achievement award not to mention an Alhambra Council of PTA Honorary Service Award in 1971. As if all that wasn't enough, she joined the late Phyllis Wainwright to convince the City to actively support saving the Alhambra Pioneer Cemetery as leaders of the Martinez Cemetery Commission. Her efforts were honored by E Clampus Vitus who named her an honorary "Widder of the Clampers". Charlene moved here from Oregon with her parents and brother in 1938. A graduate of Alhambra Union High School, class of 1940, Charlene was a talented artist who won a scholarship to the California College of Arts and Crafts but chose instead to marry well-known Martinez "Portugee Flats" resident Albert Perry, AUHS '36 and settle down here to raise a family of four children. (Editor's note: The Flats were a section of Estudillo and its cross streets from Brown Street roughly to Susana Street where many of the Portuguese immigrant families whose fathers worked in town lived in the 20s and 30s. Al Perry organized several very popular reunion picnics in the 1970s. Just the other day I referred to "Portuguese Flats" in a conversation with one of his grandchildren who corrected me immediately. "My grandfather insisted that it be called Portugee Flats." I was not surprised as Al never was one for politically correct conversation. I'll let oldest daughter Nancy Perry White pick up the story as she told it in Preface to the posthumous second edition of Charlene's "Martinez: A Handbook of Houses and History" published in 2008. "Our family vacations found us touring museums. As a child I would have preferred a water park or maybe Disneyland. She felt that we needed to learn about our past to appreciate what we had. Being a grandmother now, I can fully appreciate that. "In 1959 we moved from Vine Hill into a house at 334 Talbart Street. She had her eye on the house for a long time and eventually figured out how to buy it. It was an old Victorian house with a wonderful yard and lots of camellias, a large front porch, very high ceilings, tall windows, beautiful hardwood floors, and a bay window. In researching the lineage of the home she found a new passion. She learned how to find the histories of the beautiful old houses in Martinez. From that point on she was hooked. Anyone who showed an interest in an older home found her willing to research the past." Back to Joan Morris: "Charlene was a Renaissance woman. She loved children, loved to cook and sew, loved being a wife and mother. "Her passion for family life was obvious. She and (Al) had four children but the house was all filled to the rafters with Perry wannabes. The Perry children were always bringing home friends who'd end up staying anywhere from a few hours to a few years. "Growing up in the Perry household meant being loved and well-taken care of. Charlene found time for the PTA, the Cub Scouts and Campfire Girls. She could sew prom dresses, bake wedding cakes and tell the difference between the drive shaft and the crankshaft. She was one handy mom." The leap from researching the history of local houses to City Historian occurred because of Al. A Foremost Dairy milkman and truck driver in the days of motor delivery routes around the central county, Al's outgoing personality and quick retorts and repartee helped sell "Golden State Milk" all over his route. He was still a fairly young man when he suffered a serious heart attack which put him on disability. Soon he was pacing the sidewalks of Main Street having coffee at DiMaggio's (now Victoria's Café), carrying on an argument about some fine point with friends and keeping an eye out and an ear open to what was going on in City and County government. In 1968 or '69 he began sending "Do You Remember" lists to News-Gazette editor Lotus Lydick. She ran the lists of long gone teachers and principals, businesses and events in the popular front page feature, Column One. As was typical with anything Al said or put into print, there were two immediate reactions: cheers and nods from those who agreed and sharp retorts and accusations of spreading false information from those who didn't. But even when controversial, those lists were the actual beginning of an organized attempt to preserve and celebrate Martinez' past. Before long he had a weekly 'man about town' column in the News-Gazette where he wrote about the good old days growing up in the community, speculated on possible nefarious behavior among prominent town officials, businessmen and individuals and exposed a plot or two. The column garnered even more reaction than the memory lists. It was that column that led directly to the formation of the Martinez Historical Society and the campaign to save the rundown Victorian Borland home and to establish in it the Martinez Museum. When the George R. Gordon building was built at the northwest corner of Escobar and Court Streets in the mid 1970s the Contra Costa Community College District already owned the Borland home which it used in its early years for offices. Tearing it down to build a staff parking lot was a no brainer to district officials and trustees. But when Al heard about the plan, he hit every roof he could find. The College District whose then-chancellor was Martinez native Jack Carhart, the Board of Supervisors who were part of the parking lot plot and Martinez City Hall all found themselves in the middle of a verbal and print generated firestorm. Although the couple seemed like complete opposites - Charlene, tall, regal, composed and Al, short, energetic and always with a funny or sharp comment - they made a perfect team as a couple, as parents and as advocates for a cause. So while Al buttonholed everyone he saw, Charlene's house research skill was put to good use. And the fact that the County's blue eyesore skyscraper had recently replaced the Curry mansion and several other late 19th century treasures and the County Jail construction was then in the process of destroying a number of other historic homes lent credence to the Perrys' fight to save the Borland home. In the end, thanks to the negotiating skills of then-Martinez Mayor John Sparacino, the District, the County and the City worked out a way to save the building and provide parking for District staff. It was worth the effort to achieve because it meant they got Al off their backs and wouldn't be accused of destroying any more valuable history of the community unearthed by that very nice lady, Mrs. Perry. Al died in 1988 and for the rest of her life, Charlene was always grateful when reference was made to Al's contributions to the achievements for which she was being honored. They truly were Martinez history preservation's all-star team. She served as the first director of the Martinez Museum laying the groundwork for organizing the large collection and the frequent exhibits highlighting some aspect of our community's past. As a researcher she was a stickler for verification and always labeled a popular legend as such and refused to use it in any of her published material. Charlene was named Martinez City Historian in the early 1980s and was principle writer of what is now known as the 'white history book" Martinez: A California Town. Although she "semi-retired" several years before she died, she never stopped paying attention as Martinez Unified School District officials found out when they proposed selling the Susana Street property on which the District Office stood. Charlene and her Alhambra Cemetery Commission partner Phyllis Wainwright fired off protest Letters to the Editor. Among the bombshells the pair lobbed was the decisive one: proof that the family who had left the property on which an early Alhambra High School building had been located had stipulated that the provision would be revoked if ever the property was not used for the support of education in Martinez. That was the end of that idea! I hope you enjoy her columns as they appear from time to time in The Patch. And for those of you who weren't fortunate enough to know Charlene, who she was is all around us all the time in our pride in this "California Town's" history and spirit.